Every year since 1969, Oregonians and friends have been doing their part to care for one of their own. In this case, they have been caring for the 363 miles of publicly accessible beach that creates the entire western edge of Oregon. It may be no big surprise that in 1969 then governor of Oregon, Tom McCall, called upon Oregonians to unite to Stop Oregon Liter and Vandalism (SOLV) what with the long-heralded ecological mindset of Oregonians. The fact is, only two years before all those glorious miles of beach and shore had been designated publicly accessible and suddenly Oregonians saw just how much liter and waste washes up every year on those beaches. The Oregon SOLVE t-shirts donated by the Chinook Winds Casino. This year, on March 22nd, folks gathered and did it again. According to SOLVE, 45,955 pounds of liter and marine debris were collected, including 14 tires. I think we can all agree that those are some impressive numbers. I have my own numbers attached to those figures because I took my teen service group, MAZI, to Lincoln City, Oregon to participate in the beach clean-up. It was a glorious, sunny day and the 10 young people I took got lots of sun and smile-opportunities for the two hours we spent cleaning up a small section of Lincoln City’s northern beach. My specific numbers are 10 young people, 3 adults, 12 bags, 1 pallet, 1 large pole with a board nailed to it, 1 partial seagull corpse, and a whole bunch of various plastic and marine debris in those 12 bags. But as I was kneeling in the sand for two hours, I began thinking about something. There’s seeing and then there’s seeing. Starting a good ten minutes after the rest, the MAZI teens were the second-to-last group to get to the beach. As I stepped off the stairs and onto the sand, there were green tee-shirts scattered all up and down the immediate vicinity. It looked a bit like a confetti cannon had been lit. There were a lot of families at our volunteer location so lots of small people were running up and down the beach followed by their big people running and calling after them. It reminded me of some odd, ecological version of an Easter egg hunt but instead of collecting dyed eggs, the kids were collecting pop cans, water bottles, and whatever other thing they could get their hands on. They were obviously having a great time and feeling awesome about doing their part to help the environment. And those grown-ups running around after them, shouting directions for whatever non-beach-friendly item they’d spied, well, they looked pretty happy too. And after an hour or so, they all trooped past the bunch of us, kneeling in the sand, busily picking up piece of plastic after piece of plastic. Tumbled plastic “beads” – this one is about 5/16″. I wanted to call them back to me, to show them my bag. To put in his little hand the pieces of plastic I had found and tell him about why it is so important to get the tiny debris off the sand as well as the tires, but a look at his mother’s face told me to hold my tongue. A bag filled with ten big things is way more exciting than a bag with 100 tiny things. It is easy to be so busy looking for the big problems, that the little ones beneath one’s feet go unnoticed. It is easy to see what we want to see. It is part of most humans’ nature to be the person who tries to find the tires on the beaches. And heaven knows those tires need to be moved to a better place than the beach. But the person who is only excited about ridding the beaches of tires and brightly colored pop cans and broken sand buckets misses the real crisis. Over time, all sorts of things have made their way into the ecosystem. Many of those things either look harmless or are too small to be quickly seen. Both of these issues are creating a very different crisis. 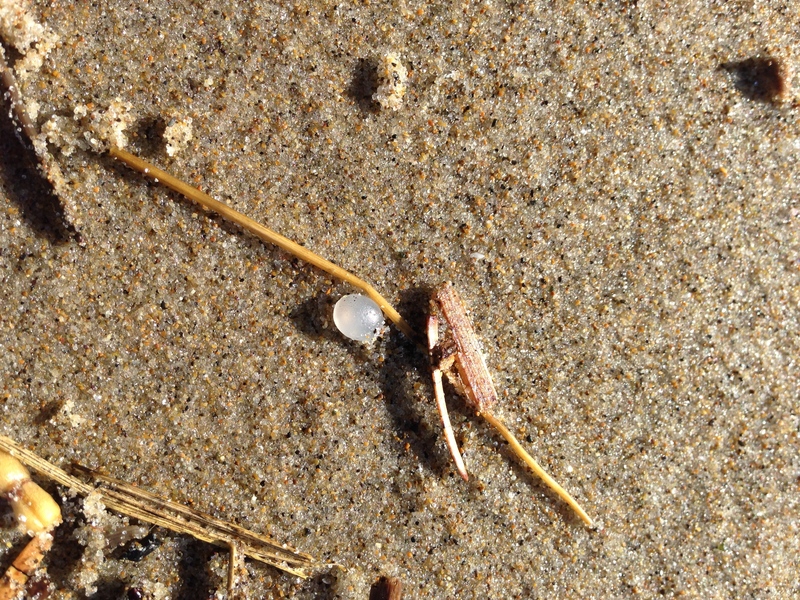 Tumbled bits of plastic look like something a fish might actually think is food, unlike a bucket or pop can or tire. And when a fish eats lots and lots of tumbled plastic, its place in the food chain means that we eventually are eating the effects of that plastic. In other words, when it comes to beach cleaning, we have to stop thinking about what attracts our eyes, and instead think about the eyes of other Earth inhabitants. 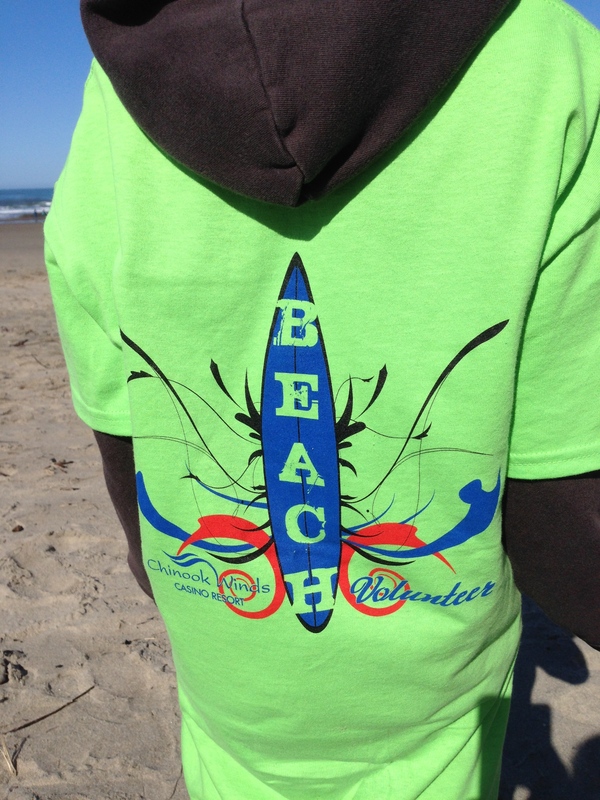 Participating in SOLVE’s beach clean-up was a great experience and I’ll likely do it again. But it also got me looking around for the folks busily running around seeing what sort of big thing they can clean up while not seeing all the little things that are just as important to fix. The fact is, both the big and the little needs doing. But the real seeing is who does what. No matter what community you live in, there are opportunities for a person to get involved making the world a better place in some way. I challenge each of you to find something to get passionate about – make the world better for everyone or just one person – and you will be a better version of yourself too. Just don’t forget to see more that the big things because there’s a ton of little things that create a much bigger problem if for no other reason than folks don’t see them. 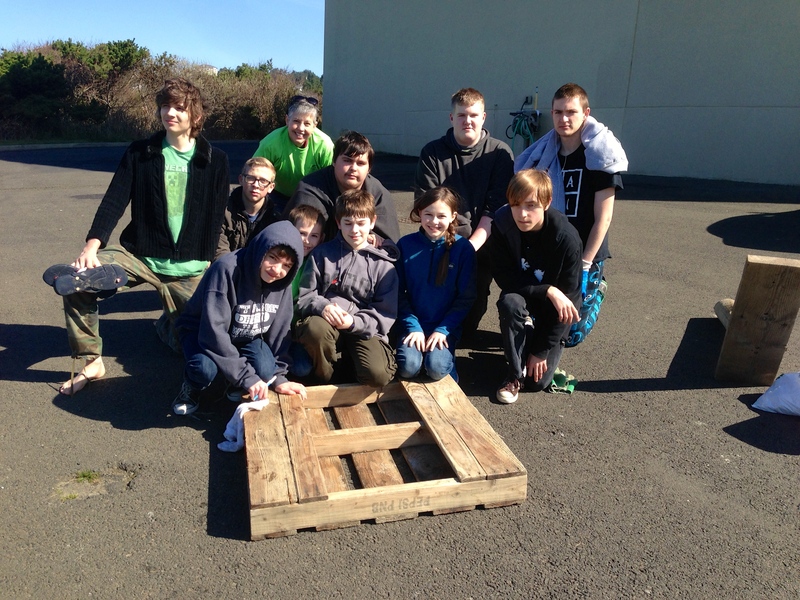 This entry was posted in Front Page, Life and tagged Lincoln City, Oregon, Oregon Beach Cleanup, service projects, SOLVE, working with teens by kristina. Bookmark the permalink. This was timely and inspiring for me on several levels today. Little things do matter, sometimes more than big things, sometimes just very differently. That’s exactly right. I know far too many people who only put out effort if they can do the equivalent of “picking up the tires”. It wouldn’t irk me so much if they didn’t backhandedly negating the efforts of the sifters and the picker-uppers of tiny things. Because it all adds up – in any situation.